To apply for a green card to the United States, for the sake of an analogy, is sort of like trying to find a table at a crowded restaurant with more people in the restaurant than the tables and chairs can accommodate. While the order in which a party puts a name on the waiting list has an impact on when they get called, different parties will have different odds of being the next one called, as bigger parties will only be able to fit at bigger tables, while couples can fit at tables small and large. While size may not be an issue when it comes to those who apply for a green card, the time needed for green card processing may be dependent on the individual and their profession. Two of the most common ways people apply for a green card are through family and work. Not all family and work visas are made equal, however. In fact, some may experience longer green card processing times based on a priority system built into these categories. Regarding those who apply for a green card based on a connection through family, there is a definite pecking order. For spouses, parents, and unmarried children under 21, there are an unlimited amount of visas available to be secured prior to obtaining a green card. For all other categories, though, there are yearly quotas attached and a tiered preference system, meaning these relatives will be subject to the rigors of the green card processing system. There are four tiers for the family-oriented green card system after spouses of U.S. citizens, parents and unmarried children under 21. First priority is given to unmarried children of U.S. citizens above the age of 21. Following them are spouses of a permanent resident and (note that someone with a green card who is a permanent resident is not the same thing as a citizen) those unmarried children who are over 21 years of age. Rounding out the category are the married children of U.S. citizens and their families, and last but unfortunately least in order of preference, brothers and sisters of citizens. 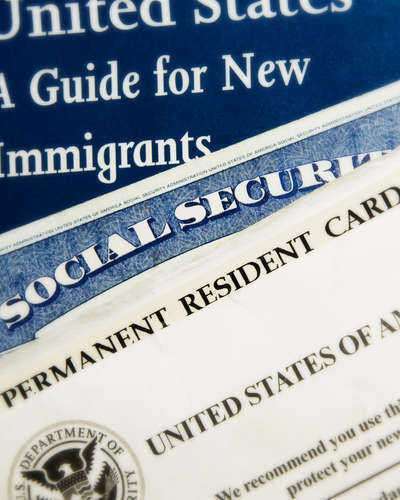 Green card processing for this last category may take upwards of a decade to complete. Regarding those who apply for a green card in order to serve our country through work, there is also a totem pole of sorts. Here, distinctions are not made based on the closeness of familial connections or age, but on the type of service these immigrants may provide. Green card processing is kindest first to those who possess an extraordinary talent, ability, depth of knowledge or prestige. After that, different skills are taken into account, and you can probably guess what the different groups would be. The second group earns their preference on the basis of an advanced degree or other special talent. After that, preference is afforded to skilled workers, then special classes of workers and finally workers whose toils will result in job creation for others.